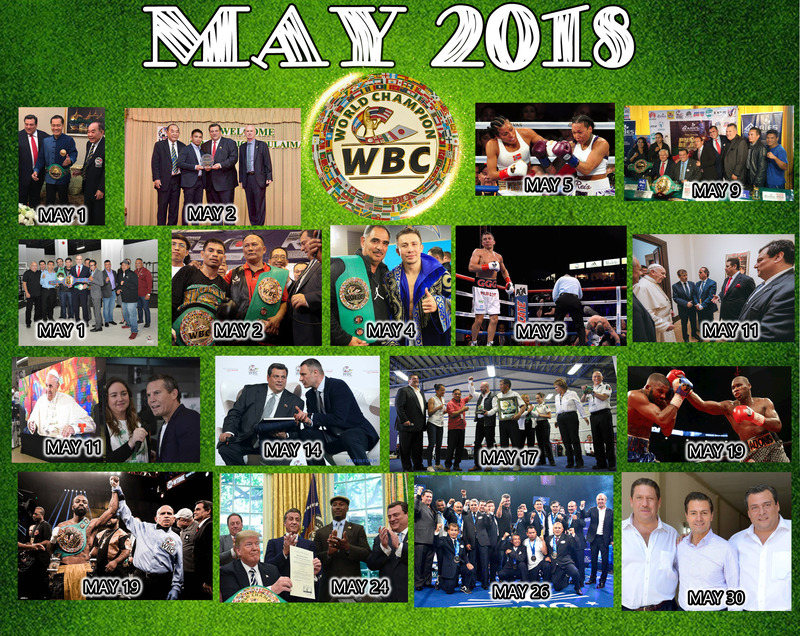 No doubt about it, May has been a bustling month for the World Boxing Council, with a packed Agenda of activities and some history-making, en route to some significant milestones. World Boxing Council President Mauricio Sulaiman met with Thailand’s Sports Minister Weerasak Kowsurat, reaching a set of important agreements. The annual awards ceremony for the Very Best of the Asian Boxing Council was held, confirming the great presence and importance of the ABCO in this region. The event was attended by the President of the WBC Mauricio Sulaiman, General Kovid Bhakdibhumi, and members of WBC Asia, Damrong Simakajornboon, Kevin Paul Noone, Kiate Sirigul and Patrick Cusick. The WBC met in Los Angeles with Carlos M. Sada, from the Ministry of Foreign Affairs to work on the project “2 Nations 1 Dream,” a very successful program that seeks to dissolve barriers between countries, creating harmonious links of lasting friendship. Thai Wanheng Menayothin knocked out Panamanian Leroy Estrada in five rounds, superbly defending the World Boxing Council minimumweight title, drawing with the record of Floyd Mayweather Jr. Fifty wins and no defeats. The timely introduction of a special award to be presented to The Trainers of World Champions. The objective of this initiative is to recognize their expert, dedicated and exceptional work, which is essential for the triumphs of the Champs. An historic fight that marked the arrival of women’s boxing to the HBO network. The undisputed welterweight world champion, Colombian born, Norwegian Cecilia Braekhus, defeated Kali Reis, from the United States in a fantastic fight. Considered one of the best champions in the world, Cecilia was able to get up from a knockdown in the seventh round, going on to win by decision. WBC middleweight champion, Gennady “GGG” Golovkin, retained his undisputed status as the division’s number one by knocking out Armenian Vanes Martirosyan in the second round. This was the first time Vanes was defeated by KO in his career. A video conference between young Mexicans and Pope Francisco, organized by Scholas Mexico, with the presence of former world champions Julio César Chávez, Guadalupe Pintor, Pipino Cuevas, Isaac Bustos, José Luis Bueno and Humberto “Chiquita” González. At the Vatican, Hector and Mauricio Sulaiman, held a private audience with the Holy Father, presenting the reports of activities and future actions of “Scholas Mexico” and “BoxVal, Boxing with values” in Mexico and the rest of the world. World Boxing Council President Mauricio Sulaiman, and former WBC Champion champion Vitali Klitschko, who’s now the Mayor of Kiev, the Capitol of Ukraine, held a press conference to present our next Convention, September 30 to October 7, in this beautiful City. The successful conclusion of the second amateur boxing tournament organized by the Administrative Body for Prevention and Social Readaptation and the Federal Protection Service of the Mexican Security Commission. The event was attended by the National Security Commissioner Renato Sales Heredia, Mr Alfonso Ramon Bagur who’s Commissioner of the Federal Police and WBC President Mauricio Sulaiman. A memorable world title double bill. In a dramatic fight, WBC light heavyweight champion Adonis Stevenson drew with former WBC super middleweight champion Badou Jack, in a thriller which could be in the running for Fight of the Year. And WBC featherweight champion Gary Russell defeated his mandatory challenger, the courageous Californian Joseph “JoJo” Diaz Jr, by UD. On a day which will always be remembered and cherished for encompassing and embracing human equality, dignity and inclusion, President Donald Trump of the United States, signed a posthumous Presidential pardon for boxer Jack Johnson, in the Oval Office of the White House. Jack Johnson was the first African-American boxer to win the heavyweight championship. He suffered appalling and blatant discrimination and racial abuse, which resulted in him being jailed for ten months. A magnificent Ring Telmex Telcel boxing Gala, to celebrate, commemorate and honour the tenth anniversary of the RING TELMEX-TELCEL Program. This event greeted a glittering lineup of Mexican boxing legends. And there were an exciting array of fights with the participation of boxers who’ve come on leaps and bounds, due to this unique, wonderful and blossoming initiative. The President of Mexico, Enrique Peña Nieto, met with young people from Scholas Ocurrentes Mexico, to talk about topics of interest, such as security, inclusion, social welfare, quality of life and its purposeful direction.